As I wanted to field a modern British infantry platoon for Force on Force, I looked at the then-available ranges, namely Old Glory’s and QRF’s before selecting the latter. The Old Glory range seemed adequate (although some of the poses are hit or miss as usual with OG) but the packaging made me pass them over. Not only is the actual pack content unclear but ordering something like 150 figures and using 1/3rd to field a platoon didn’t seem like a really good idea even though OG’s per figure prices are quite competitive. Flytrap Factory has since released a pack of “Royal British Marines” which look good but are limited to small arms at the moment. 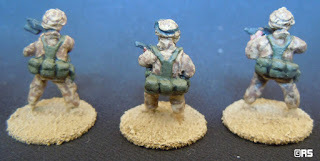 On to QRF’s figures! 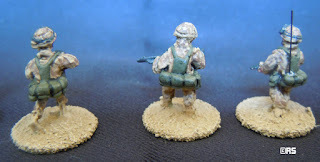 These are sold in packs of 8 figures covering the whole gamut of smallarms and support weapons which has the advantage of minimizing the number of leftovers. 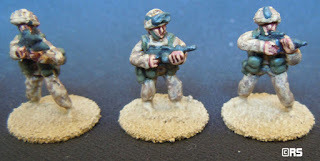 While the photos on QRF’s website do give an good idea of the content of each pack, they are not very detailed. The close up photos at the bottom of this post should give you a clearer idea of what they look like. The strongest point of these figures is the attention to relevant detail to make these actually look like British squaddies rather than generic grunts with different helmets and weapons. The web gear is spot with most of the pouches worn on the lower back, as are the weapon-carrying stances and finally the poses are coherent with either stationary firing or advancing at a patrol rate. So there are none of the wooden poses reminiscent of left-foot forward Minifigs, no Rambos wildy chucking grenades nor that single figure running around like Bolt’s second cousin while everyone else strolls along. Another good point is stature: the figures are very consistent is size and you don't have underfed midgets and overweight giants rubbing shoulders. Overall, the sculpting is good although there are some issues with some figures such as miscast feet (the result of very thin bases), soft detail on some of the faces (a couple are downright mushy) and a few oversize hands. All the detail that needs to be painted is there and sharp enough to make painting easy. The weapons are as close to scale as possible and may seem a bit thin and fragile if you are used to the oversize ones found on some other ranges. To conclude, choose another range if you want to impress the boys on Frothers (not that they’d be impressed by 15 mils anyway ;-). 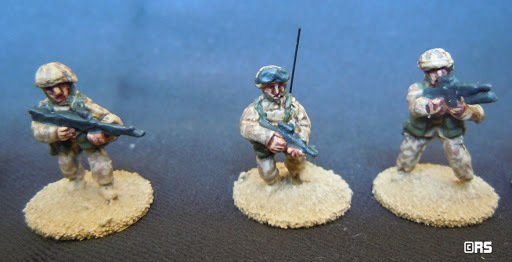 But look no further if you are looking for good figures that really capture the look of British infantry on campaign. Below is the list of the paints I used to reproduce the faded Desert DPM look. 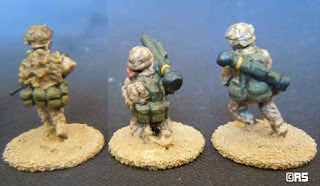 The camo pattern itself was quite simple: a basecoat of Vallejo 819, a heavy brown wash for shading, a heavy drybrush of Vallejo 819 again to clean up the base, random squiggles of Vallejo Air 35 Camo Light Brown overlaid with another lighter layer of random squiggles of Vallejo 819 to break it up. I opted for olive green webbing purely as artistic licence and then found out that olive green webbing was in fact used with Desert DPM uniforms before matching webbing became available! Which goes to show that artistic licence and MoD budget constraints sometimes match. Antennas were added the web pouches of section leaders and assistant section leaders, either left or right side to differentiate between the two. Brilliant, thanks for doing that. Very useful. Any hints on the paint job? What colours did you use? How did you do thge camo pattern? Hi, thanks for the comment. I've updated the (unfinished) text with some notes on the colours used. Love the walk through. I have actually just bought the 150 from Old Glory, also for playing FoF. 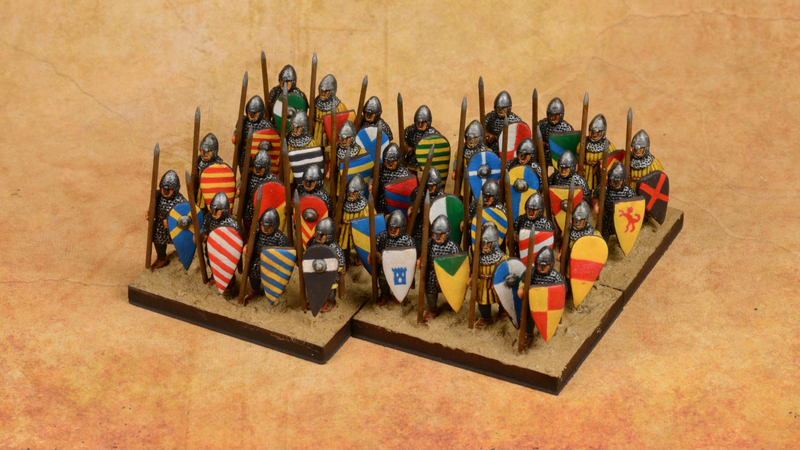 I'm happy enough with the miniatures but there are several stances where I have no idea what I'm looking at...especially the Infantry Weapons pack. Excellent review. I'm actually considering getting some of the slightly earlier 80s QRF figs.